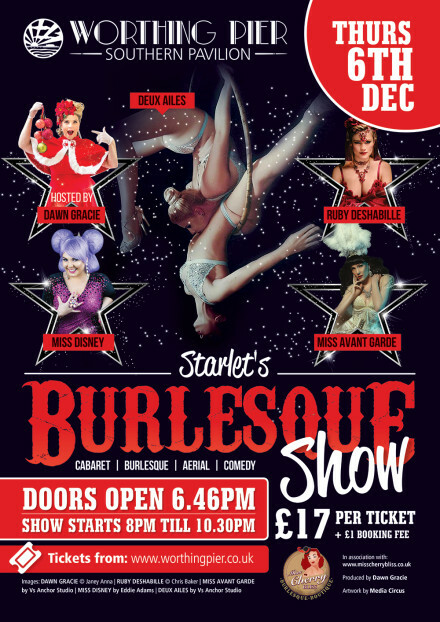 Highly acclaimed and eagerly anticipated, Dawn Gracie's production is back at the Worthing Piers Southern Pavilion for yet another evening of camp comedy, breathtaking burlesque and musical mayhem! DAWN GRACIE - Chief bauble bobbler, trouble maker, rabble rouser, audience tickler and all round mouthpiece. The host with ALL the most! DEUX AILES - Acrobatic duo, Deux Ailes combine grace, style & gravity-defying agility both in the air and on the ground. Creating breathtaking routines that have dazzled audiences across the world. Professional dancer Fiona and Commonwealth Games Circus Graduate Cory, merge the worlds of dance and acrobatics with performances that enthral and excite. RUBY DESHABILLE - This lady can whip her audiences into a frenzy or send them into a trance and always, always leaves them wanting more. Before she even knew what Burlesque was, Ruby had a fascination with all things theatrical and fabulous, feathered and glittered, exotic and sensual. MISS AVANT GARDE - Graceful and poised perfection, this lady has an ethereal and hypnotic performance style. But dont be fooled by her delicate appearance, Miss Garde will embrace the opportunity to shock and deliver on stage, and leave you wanting more. MISS DISNEY - What festive show would be complete without an epic Disney singalong compliments of Brighton's own Queen of Disney? This effervescent, joyful and balls o steel vocalist will have you singing along and raising a glass of eggnog in no time. Prepare to be dazzled by the impressive lungs of Miss Disney!